Taking inspiration from The Streets. Fun and frolics have long been engrained in Henry Holland’s collections – remember the cowboy themed AW17 offering where bangers by Miley Cyrus were the soundtrack and Woody Woodpecker played an integral part in the fashion proceedings? This time around, the fun came on the feet, with sandals decorated with bright, sparkling tinsel in a range of vibrant hues. Obvs, we need a pair for party season. A wide range of varying silohettes (some new, some familiar) have been a key part of this year’s LFW, and Holland followed suit by ensuring his collection had a diverse pack of cuts. Ultra-flared trousers, frill-bottom skirts and asymmetric dresses were met with a mix of structured military coats, cropped denim jackets and cuffed joggers, highlighting the diversity of Holland’s designs. Dry your eyes mate, because there’s pretty much something for everyone, regardless of what you’re thinking or feelin’. 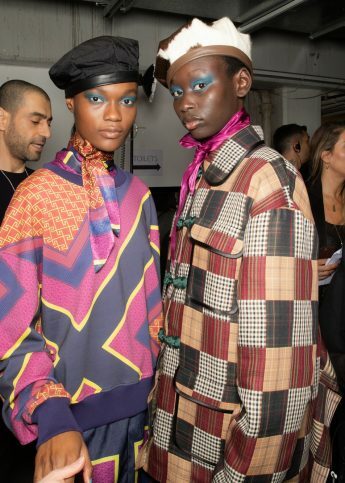 Patterning, tie-dye and graphic tees rule supreme at House of Holland's AW19 show.